One version adds a retextured Masque of Clavicus Vile and Blades shield to match Axeface's Ceremonial Blades Armor. 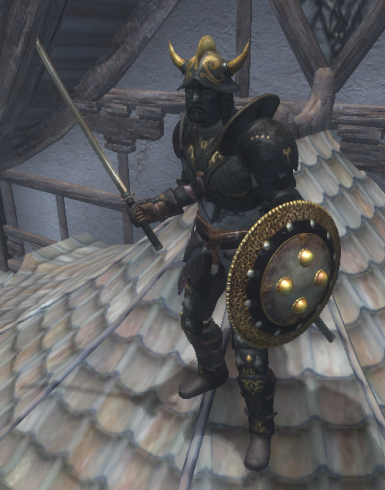 The second version combines Axeface's original armor with the female cuirass in Karandras' related mod, and also adds the new helmet and shield. 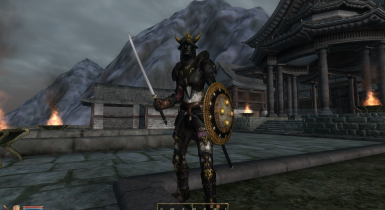 Please note that the only files that are originally mine are the retextures of the Masque of Clavicus Vile and the shield, and the esp that places them in the world. To use any of the other files you need to contact their respective creators. Axeface, Sickleyield, Teamff, Karandras, and Demjon - may he rest in peace. Version 1.1 (for either file) - I fixed the texture paths in the meshes after someone pointed out the error. I apologize for the inconvenience. I like the look of the Masque of Clavicus Vile, but the game version clashes with other vanilla armors (and frankly, who wants armor to fortify personality?). 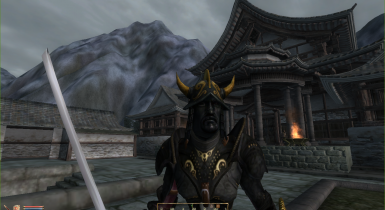 I think the style best matches the Oriental style armor from the Blades, so after I found Axeface's beautiful Ceremonial Blades Armor (http://oblivion.nexusmods.com/mods/2878), I fiddled with the original Masque of Clavicus Vile's texture (with a TON of help from the late Demjon). Here is the result. 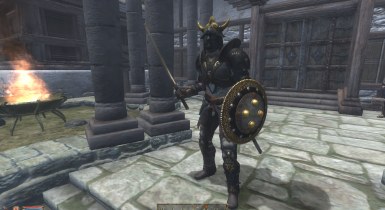 I also combined the male and female versions of the cuirass into a single mod because the original by Axeface has only a male version and the female version is in a separate mod by Karandras (http://oblivion.nexusmods.com/mods/13107). They strangely are not compatible with each other, but that problem is now solved - if your character is male, but your spouse or roommate plays a female character, now you can both use the same mod (isn't that cute?). 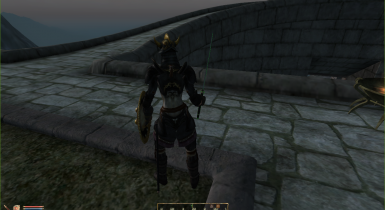 I also made equipping the cuirass hide your amulet, and equipping the gauntlets hide your rings (it's just silly otherwise). One of the files adds only the new helmet and shield. Find them in the Cloud Ruler Temple Armory. It is compatible with Karandras's or Axeface's mods, if you prefer to keep them separate (just remember, if you choose that route you will not have the male and female cuirass exist in the game at the same time). The other version includes all of the armor, both male and female, and the new Masque and shield (I also included the original retexture of the Blades helmet from Axeface). They are in a display case in Cloud Ruler Temple's Great Hall to the left of the enormous fireplace (you must be part of the Blades faction to open the case). All items are unenchanted, heavy armor ratings. You can enchant them to your liking at an altar, or use the construction set to customize something fancy. I suppose if you're dying for a special enchantment and do not have the know-how, you can send me a request. Requirements: I use Robert's Male and Exnem's Eyecandy female (C-cup). These are probably best for compatibility, but hey, what do I know? Installation for either version: Extract the .esp to your Oblivion "Data" folder. Extract the zipped folders into your "Data" folder also, merging the textures and meshes folders with those already on your computer. Make sure you activate the mod by checking the box next to it in the Data Files menu from the Oblivion launcher. Uninstallation: This does not replace any of the original textures or meshes, so simply delete the files this mod uses. But be warned, if you do this the armor will haunt you to the end of your life. Note: In the pictures, the male is holding the vanilla Goldbrand, and the female is holding the vanilla Ebony Blade. I may retexture a katana somewhere down the line if I ever get really bored, but it doesn't seem necessary with those blades available.